With more than 200 available classes each week, THPRD is the Beaverton area's leading provider of group fitness classes. 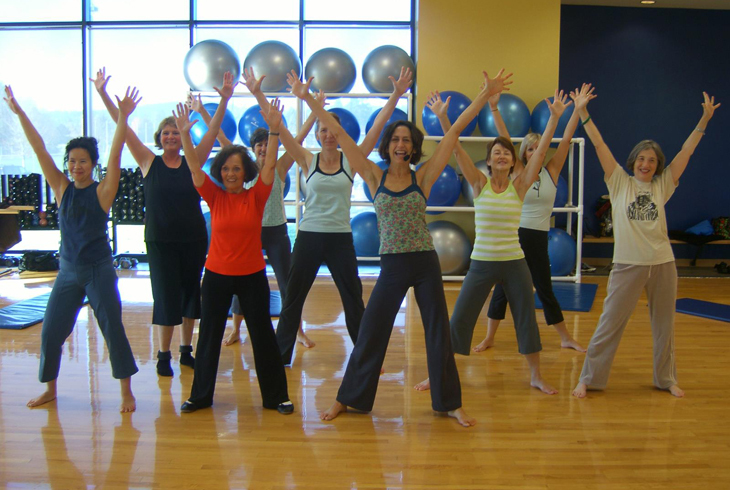 We offer yoga, Pilates, Zumba, BodyPump, BodyCombat, Tai Chi, and more – including water fitness classes. Whether you’re looking to tone muscles, slim down or stay active, you’ll have plenty of classes from which to choose. The district’s Deluxe Pass is your passport to unlimited group fitness classes at any THPRD facility. The pass – which can be purchased for one month, three months, six months or a year – includes two hours of free childcare daily and unlimited drop-in privileges at weight/cardio rooms, pools and basketball courts throughout the district. Daily drop-in is available for just $10 (childcare not included). Click here for rates and a complete list of Deluxe Pass benefits. The majority of THPRD’s group fitness classes are drop-in programs, but as a service to our patrons 55 and better, we do offer a limited number of group fitness classes each term at the Elsie Stuhr Center that do require pre-registration. We invite our Stuhr Center patrons to check out the current activities guide or search online to find a list of these classes. For more information, call 503-629-6342.